We're back with another episode all about plague-TGFA: Thank Goodness For Antibiotics! Today we'll focus on the status of plague in the modern world: where it is, where it isn't, and what we can do about it. And as always, we'll let you know whether or not to put on your scaredy pants. Zika virus may not have as long and storied a history as many diseases we've covered, but in a short time it has managed to make a big impression. Today we'll talk about how Zika wriggled its way out of obscurity and cover its journey from a mosquito's mouth straight to our newspaper headlines. From the first discovery of the virus in a Ugandan jungle, to the heartbreaking effects only recently discovered, to the future of Zika research and vaccine development, we'll fill you in on everything you want to know and then some. Are you ready to dilate your mind? Or at least your eyes? We hope so, because that means you’re ready for another Poisoncast episode! This week we’re joined by our friend Matt Candeias from In Defense of Plants to chat about Atropa belladonna, a lethal yet beautiful plant that lives up to all of its many names, including deadly nightshade, belladonna, devil’s berries, and naughty man’s cherries (yes, really). We’ll explore the ancient myth, medieval lore, and modern murder that make up this plant’s history, and then we’ll venture into the nervous system to find out what belladonna has to do with fight or flight. Finally, we talk evolution to see how this deadly substance helps out its plant producer. Pour yourself a quarantini and listen up, making sure you’ve added the right berries to the mix, of course.Check out Matt’s website indefenseofplants.com and follow him on twitter @indfnsofplnts! You’ve seen the recent headlines and heard the news reports, but they’re only part of this deadly virus’s story. This week we’re covering the rest. We take you on a one-of-a-kind tour of measles, exploring how this vaccine-preventable virus can wriggle its way into your cells and cause short-term misery and long-term damage. Then we trace the history of this notorious killer from its bovine beginnings to the devastation it wreaked on unexposed populations. The tour ends with a look at measles by the numbers around the world today. If you take home one souvenir from this tour, let it be gratitude for vaccines! This week's episode is nothing like any of our past episodes, and there will never be another quite like it. How can we be so sure, you ask? Because this week, we're covering prions, the terrifying, genetic material-less infection that is 100% fatal and caused by nothing more than a humble protein. And not just any protein, a protein you already have in your body. Are you sweating yet? Good. Then settle in and listen to the amazing biology of this terrifying twisted proteinacious particle, the fascinating and fraught history that led to its discovery, and the current research on just how scared you need to be of prions in your brain. Arr, mateys, climb aboard for a swash-buckling tale of when the high seas were full of disease! Today we’re covering a non-infectious but no less terrifying scourge that has wrecked millions of lives and sent even the bravest of sailors quivering in their boots: Scurvy. From the open ocean to the California gold rush to modern times, scurvy has been causing collagen breakdown throughout human history, and we can blame it all on...evolution? Ep 19 Scurvy: Thanks a lot, evolution. What do Korea, Slovenia, Finland, and the southwestern US all have in common? If you guessed Hantaviruses, you’d be quite correct. Today we bring you all the details on hantaviruses, from the deadly and terrifying hantavirus pulmonary syndrome, to the less lethal but still horrifying hemorrhagic fever with renal syndrome. From its long road to discovery, through the infamous 1993 outbreak and up to the present day, you’ll never look at an adorable little deer mouse the same way again. Are you hungry for braaaaiiiinnnnssss? Or for fugu at the very least? We hope so, because this week we’re talking zombies and tetrodotoxin. In this crossover episode with Dr. Shane Campbell-Staton from The Biology of Superheroes Podcast, we trace the origin of the modern pop culture zombie back to its Haitian roots. We explore the outrageous evolutionary arms races in which tetrodotoxin, the principal component of so-called ‘zombie powder’, has played a major part. And finally, we answer the age-old question: can a pufferfish make you into a zombie? Be sure to check out Part 1 of this crossover episode, Episode 7 of The Biology of Superheroes Podcast, where we discuss the biological basis of death, whether we’re prepared for a zombie outbreak, and behavior-manipulating parasites. You can follow Shane @superbiopodcast on Twitter. This episode is so good that we’re putting it out a full day early. Pour yourself a quarantini and cozy up with us as we tell you a story of a bacterium that slowly strangles children to death, a scientific quest that helped shape the understanding of infectious diseases, and a great dog sled race across wild and frozen lands to stop death in its tracks. The main character of this story is, you guessed it, Diphtheria. This dreaded disease still lingers, infecting children throughout the world today with its stinking pseudomembrane. But don't worry, it's not all bad news... we have a vaccine. We've gotten pretty graphic on this podcast before, but this episode takes it to a whole new level. The omnipresent Staphylococcus aureus is a bacterium that wears many faces. Often that face is harmless, but Staph has the power to invade and infect nearly every organ of the body, leaving destruction (and a lot of pus) in its wake. While Staphylococcus aureus has been wreaking havoc on humans since well before the discovery of antibiotics, Methicillin-resistant Staph aureus (MRSA) has risen to terrifying prominence as resistance becomes the new norm. If any disease could make you run out (or stay in) and wash your hands, it’s this one. 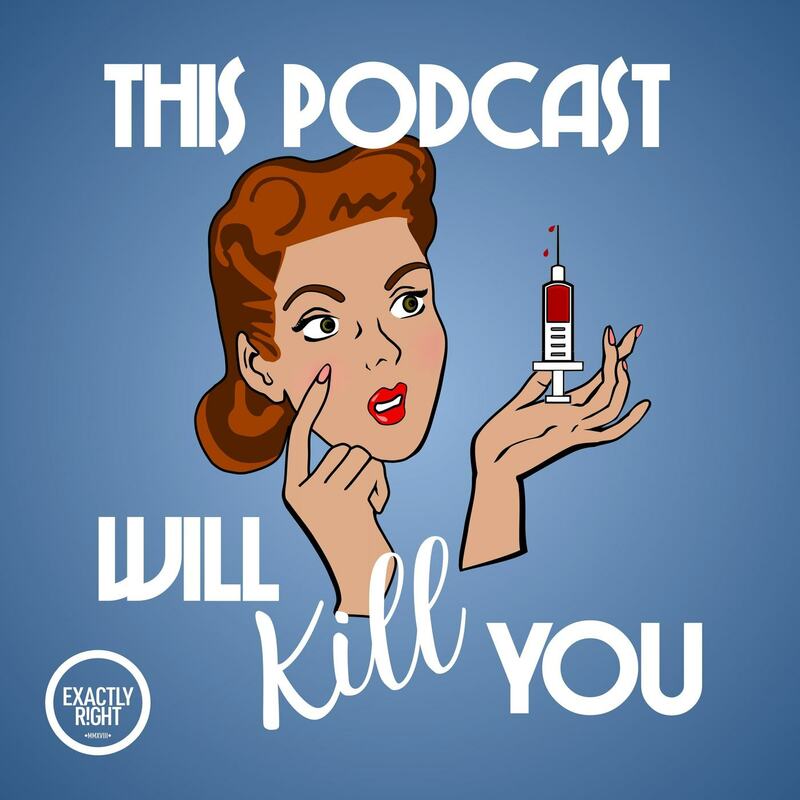 As always, you can find all of our sources at thispodcastwillkillyou.com/episodes. After a long hiatus we are back with a much anticipated look at one of the most feared diseases of all time: rabies. We cover everything from its evolutionary history to its massive case fatality rate, from why it makes you slobber so much to how Pliny the Elder thought you should treat it (spoiler: don't try it at home, folks). Sit back with a foam-topped quarantini in hand and enjoy our first episode of season 2. What's the difference between a physician and a pretender, a magician and a poisoner? That's a question we'll try and answer in today's episode! We are very excited to bring you our first botanical poison crossover episode with our good friend Matt Candeias of the awesome podcast and website, In Defense of Plants. This week, we'll talk about Wolfsbane, or Monkshood, or Aconitum, or any of its various common names. The point is, get ready to learn about a pretty gnarly poison, its history, how it affects your body, and why on earth a plant would make such deadly compounds from an ecological and evolutionary perspective. Don't forget to check out our guest spot on In Defense of Plants where we talk about two plants commonly used in herbal remedies. You can find it on itunes or wherever you are listening to this pod. Check out Matt's website indefenseofplants.com and follow him on twitter @indfnsofplnts! The cherry on top of our first season, this bonus episode features more of Frank, Hillel, and Brryan's stories. Frank and Hillel, who live on opposite coasts of the US, share what it was like for them to live through through the AIDS crisis in the 1980s and 90s. Brryan and Hillel also share their experiences living with HIV today. We were incredibly moved by all three of their stories and are so honored to get to share them with you. We hope you enjoy it! If you'd like to hear more from Brryan, you can find him on social media @BrryanJackson, and also find his website here. If you'd like to learn more about Being Alive LA, the speaker's organization Hillel mentioned, you can find their website here. This is it, y'all: the season finale. This week we’re talking about HIV/AIDS, one of the biggest pandemics of modern times. We were fortunate enough to speak with three individuals who have had vastly different experiences with HIV/AIDS. Frank Iamelli, who took care of many of his friends throughout the epidemic, Hillel Wasserman, who has been living with HIV since 1987, and Brryan Jackson who was diagnosed with AIDS when he was only 5 years old. 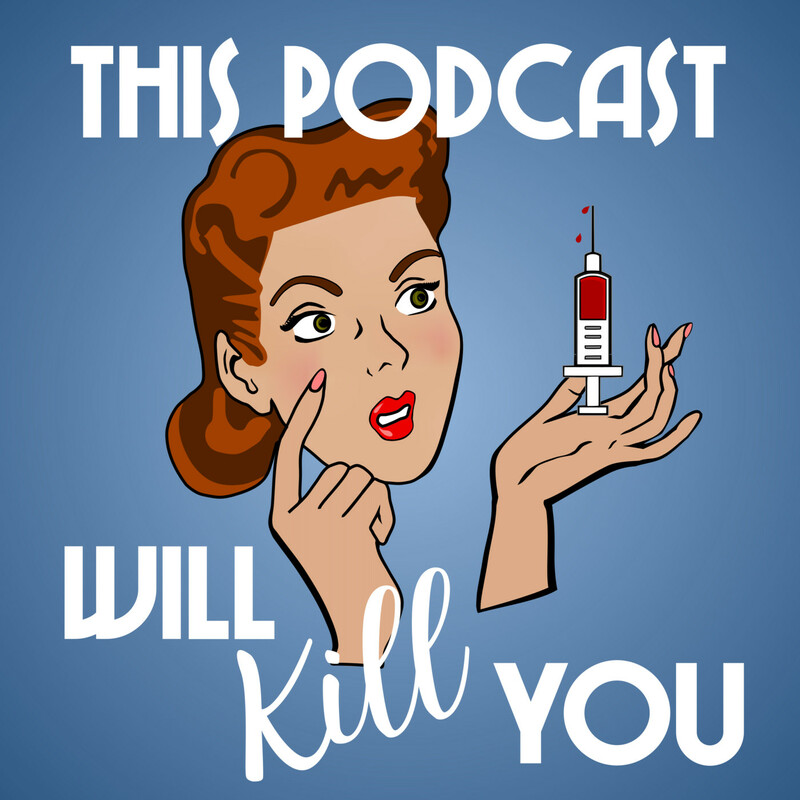 In this episode, you'll get a glimpse into their stories and then we'll fill you in on all of the biology, history, and present state of HIV in the world.Don’t forget to tune in next week for our special bonus episode where you will get to hear more of Frank, Hillel, and Brryan's stories in depth. In the meantime, here are a couple of links to Brryan's website and Being Alive LA which you'll hear more about next week! Let's face it. This is the episode you've been waiting for. Are you ready for one of the most publicized epidemics of the century? Because we're ready to tell you about it. Ebola has been in the scientific consciousness since 1976, but why did it take an outbreak of epic proportions for you, dear listeners, to hear about it? Well, listen closely for the answer. Special guests this episode include badass scientists Lauren Cowley, Nell Bond, and Sarah Paige, who will share their first-hand experiences with the 2014 Ebola epidemic. Today we're talking about yellow fever, a disease with a history as colorful as its name, and a vector as pretty as a picture (depending on whom you ask, I suppose). From an epidemic that decimated Memphis, Tennessee in the late 1800s, to the development of the vaccine, to where the offending mosquito hangs out today, we'll cover everything you need to know about this disease. Like for example did you know that A. Ham The Man himself was infected?! Yeah, me neither. Let's learn things together. Ep 10 Yellow Fever: Is there a Hamilton song about this? Today, we’re taking a page straight out of Dickens and talking about tuberculosis- a disease as rich in history as it is in bloody sputum. We'll travel the path of an individual Mycobacterium tuberculosis as it makes it way down the respiratory tract of its victim and waits patiently, hidden and untouchable. We’ll learn why Nicole Kidman's skinny physique was so en vogue in Moulin Rouge, talk about ‘The Royal Touch’, which isn’t quite as creepy as it sounds, cover enough of Koch's postulates that you can give yourself an honorary microbiology degree, and oh so much more. It's both a disease of dinosaurs and a plague of people. A gin and tonic might make you forget how much those bites itch, but it won't protect you much from this mosquito-borne monster. That's right people, today we're talking about malaria! We're super excited to tell you about this parasite since it's one of EAU's personal favs (are we allowed to have favorite horrible diseases?). Come along as we travel back millions of years to explore malaria's wee beginnings, trace its path as it shaped human evolution, take a short botanical detour to make that G & T, and end up where we first began--in 2017. Turns out that monster hasn't released humanity from its clutches quite yet. Ep 8 ABRACADABRA - Go Away Malaria! A scientific rivalry for the ages, a president with a closely kept secret, and a summertime with no pool time. What do all these things have in common? Well step right up and take a listen- today we're talking about polio, that virus that just won't quit.